When I taught Modern World History to freshman and sophomores in high school, I ended every year with a three- to four-week unit on the Holocaust. As anyone can easily imagine, the Holocaust was a complex subject to teach for many reasons. Certainly I wasn't the first and won't be the last person to discuss the topic with these students, and I'm sure that most teachers have the same types of questions that I had as I prepared my lessons, including, How close do we want to bring our students to this history? How close do we, ourselves, want to get? Why is it so important that we fathom the unfathomable? I started the unit with a lesson that I thought was beyond brilliant. Of course, it wasn't my idea in the slightest, although I still dream that I'd one day be this good of a teacher. The idea came from a history teacher at the Boston Latin School -- a woman by the name of Judi Freeman. I really hope that Ms. Freeman is OK with me posting her name here...I admit that I'm taking a rare risk in going ahead without asking her first. I don't know Judi and she doesn't know me. I heard Judi speak at a conference in my first year of teaching, almost ten years ago. She captivated me with her energy and her intellect and I went home that night to make what may have been my first Amazon.com purchase. I spent almost $200 (about half my weekly pay) on an out-of-print book that was necessary for the lesson that Judi had spoken about. The book was French Children of the Holocaust, by Serge Klarsfeld, and it is massive -- both in physical size and in historical importance. The eyes of 2,500 children gaze at us from across the years in these pages. They are among the more than 11,400 children whose lives are chronicled here, innocent children who were taken from their homes all over France to be deported and put to death in the Nazi camps. Here are the names, addresses, birth dates, and the truth about what happened to all of these children. Their biographies are brief because their lives were brief. On behalf of the few survivors of their families, this book is their collective gravestone. ... This book is born of my obsession to be sure that these children will not be forgotten. 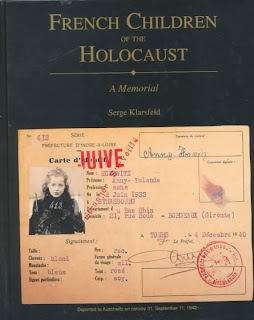 For several years, Mr. Klarsfeld used many creative efforts to gather family photographs, passports, and any information he could find about the young victims. Given the Nazis' concerted efforts to erase the children's very existence, that effort was incredibly difficult. 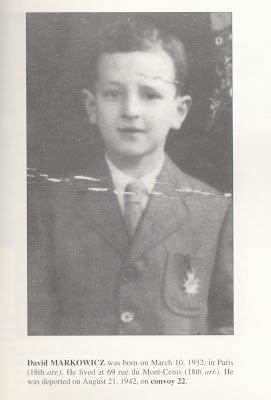 Long before the Holocaust lessons were to begin, I asked my four classes (over 100 students) for their birthdays. Then I turned to the book. For weeks, I scoured the pages for a child who shared a birthday with each of my students. When I found a birthday that matched, I put a Post-It note on the page with the particular student's name. Then I spent hours at the copy machine until I had four piles of photographs of beautiful children who shared birthdays with my high schoolers. When the unit began, I told my students that I wanted to give them each a photograph of one child so that they could have an image of a real person affected by all of the things that we would soon discuss. Next, I strategically passed out the papers. It never took more than a few seconds for someone to blurt out something like, Hey! I have the same birthday as this kid! Soon all of my students realized that they too shared a birthday with the child looking back at them. The boy photographed above shares my birthday -- March 10th. If he were still alive today, he would turn 81 when I turn 33. Incredible, because 81 doesn't even sound old to me. Ms. Freeman is a genius in my mind, if only for coming up with this lesson (and I'm guessing she has many more examples of genius). For me, there is something oddly magical and yet tangibly tragic about staring into the eyes of a young child who shares my birthday. David Markowicz was only ten when he was deported, which means that most likely he had ten birthday celebrations; ten special days when he and his family celebrated him, his birth, and his life, just as my family does for me on March 10th every year. I stopped teaching before I had children, and the only time I have picked up Mr. Klarsfeld's book since I left my classroom was to rescue it from the basement flood that I wrote about in a prior POST. Now that I look through it again, I wonder if I could have continued this lesson after having my own children. There is something almost unbearable about seeing those young boys and girls and realizing that a parent loved them, and lost them. Still, I like to think that I would have been able to do it. When I prepared the pages for that lesson, I sometimes did so like a machine -- I needed to find certain birthdays and I set out with the TV on to do my own teacher homework. But it never took long for the reality of the weight of that book, or for the brutal demise of innocent children, to hit me. When it did, I felt sick to my stomach. That's much of why I left myself weeks to gather these pages. A few different things made the memory of this lesson flood back to me tonight. First, as I mentioned yesterday, I'm still reading Viktor Frankl's book -- Man's Search for Meaning -- about his own experiences during the Holocaust, and his words beg for personal reflection. I also read that today is International Holocaust Remembrance Day, and that certainly felt like it deserved my thought. I never knew such a day existed, or that on January 27, 1945, Soviet troops liberated the largest Nazi death camp, Auschwitz-Birkenau. Most of the French children photographed in Mr. Klarsfeld's book were killed at Auschwitz. The main thing that made me want to write this post, however, is an article that a friend of mine sent me tonight. The article is linked HERE and at the risk of sounding like I still have the authority to assign homework, I really do think it's a must-read. It's awesomely eerie that Hannah sent me this article when she did because a few hours earlier, I had started a post about the work that Hannah, myself, and another attorney are doing for Wendy, my client that I've written about before (again, not her real name). Like myself, Hannah has also migrated from Ropes to another firm, but back in the spring of 2011, Hannah and I were both still Ropes associates, we had both returned from maternity leave to have our beautiful baby girls, and we were both looking for a new pro bono case to dive into. When Wendy's case surfaced, we decided to take it on together. We met Wendy soon after and a few months later, a judge gave us a very important date on his calendar. On February 5, 2013, Wendy would finally have the chance to appear before him to make her case for political asylum in this country. In the fall of 2011, that 2013 date nearly crushed our client. It seemed so far away for her that it may as well have never even existed. But here it is -- just about one week away, and we're in the final stages of preparation. When I was diagnosed, I never even counted six months out to when my medical leave would end. I just knew that I had no idea what the immediate future would bring and I worried that I wouldn't be able to help prepare for Wendy's hearing, never mind stand up in court with her in February. I remember sitting on the porch in Falmouth on our family vacation asking Hannah if she would come back onto the case despite that she had very understandably resigned from it upon her departure from Ropes. Coming to my rescue, and even more to Wendy's, she accepted without hesitation. This was great news for me and even better news for Wendy because Hannah is an excellent attorney. In fact, if I ever needed a lawyer, I'd want someone exactly like her. And so with another associate from Ropes, we have worked with our client for months to prepare for February 5, 2013. In a really self-centered way, I can't help but think that there's something kind of amazing about the fact that my first official day back to work after my six month medical leave is February 5, 2013. What an awesome way to say F-U to cancer -- to stand up in a courtroom with my client and help her try to build a new and better life. Before these last six months, that responsibility may have scared me. But it doesn't now -- at least not yet. Now it just makes Wendy's victory all the more necessary -- because I've tasted some of the fear that she knows far too well. I plan to write more about The Atlantic article that I linked above, but in the meantime, here are two of my favorite excerpts. They explore the difference between pursuing a happy life and pursuing a meaningful one. They help me understand some of my own most cherished experiences. They help me realize that photocopying those children's photographs and helping Wendy prepare to tell a tragic story before a court may not make me happy, but that doesn't really matter. Because those efforts mean something to someone else and that realization brings me enduring...hum...well...what's the right word?... it bring me enduring something-that's-a-lot-bigger-and-better-than-happiness. How do the happy life and the meaningful life differ? Happiness, [researchers] found, is about feeling good. Specifically, the researchers found that people who are happy tend to think that life is easy, they are in good physical health, and they are able to buy the things that they need and want. While not having enough money decreases how happy and meaningful you consider your life to be, it has a much greater impact on happiness. The happy life is also defined by a lack of stress or worry. "Happy people get a lot of joy from receiving benefits from others while people leading meaningful lives get a lot of joy from giving to others," explained Kathleen Vohs, one of the authors of the study[.] In other words, meaning transcends the self while happiness is all about giving the self what it wants. People who have high meaning in their lives are more likely to help others in need. "If anything, pure happiness is linked to not helping others in need," the researchers write. By putting aside our selfish interests to serve someone or something larger than ourselves -- by devoting our lives to "giving" rather than "taking" -- we are not only expressing our fundamental humanity, but are also acknowledging that there is more to the good life than the pursuit of simple happiness.